Organize all your outdoor gear on this universal rack! Heavy-duty steel, holds up to 200 lbs! Holds bikes, skis, chairs, sleeping bags, boots, climbing gear, tents, and more! Built to hold all your stuff and built to last! Heavy-duty wall rack for the outdoor enthusiast The Omni Adventure Rack is a truly customizable wall rack to organize all your outdoor gear. With 5 adjustable attachments, this rack can accommodate your bikes, skis, ,camping, hiking, climbing gear, and more! Neatly organize your entire garage and have your equipment ready to go for your next adventure! Fully customizable The Omni Adventure Rack consists of 1 adjustable track and 5 storage attachments. It's track system includes 45 mounting slots to laterally adjust the storage attachments to fit you gear. Hang your road bikes, mountain bikes, skis, boots, sleeping bags, tents, chairs, you name it! Easy to install Since the mounting brackets are fully independent from the track, you can space the brackets as needed to fit your wall. This means you can ensure you mount the rack directly into your wall's studs for maximum strength. We recommend then adding the attachments directly inside or outside of each bracket to secure your rack and prevent sliding side-to-side. Built to last Each component is made from high-strength steel and aluminum to not only handle a heavy load but also withstand wear. You can be confident this rack will serve you for many years! Bike Storage The Omni Adventure Rack includes (2) Bike Storage Attachments to hang your bikes vertically on the wall. The rubber-coated hooks securely grab your bike's front or rear wheel while also preventing scratching. 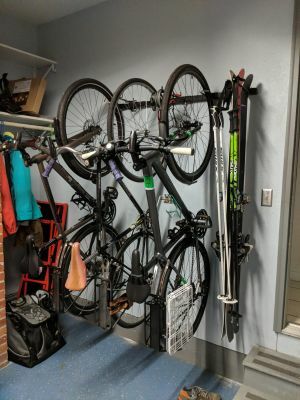 Hang your road or mountain bike to free up space on your floor! Ski Storage The rack also includes a Ski Storage Attachment to hang up to 2 pairs of skis. Simply strap your skis together and hang vertically using the the ski's front tips. The storage channel is 3/4" wide and 12" deep to fit racing, powder, all mountain, and even some cross country skis. Multi-Sport Storage A unique feature about the Omni Adventure Rack is it's (2) Multi-Sport Attachments to hang all your extra equipment. The multi-prong design includes 5 hooks to hang your backpacks, sleeping bags, boots, tents, chairs, and any other outdoor gear you have stashed in your garage! This rack got my bikes and two pairs of skis off the floor in the garage. Easy to install and very sturdy. Would recommend velcro straps for the skis to take some of the force off the brakes.